Breakfast is the most important meal of the day and should not be skipped as it helps in regulating your metabolism rate. People who skip breakfast have lower energy levels as compared to people who don’t. 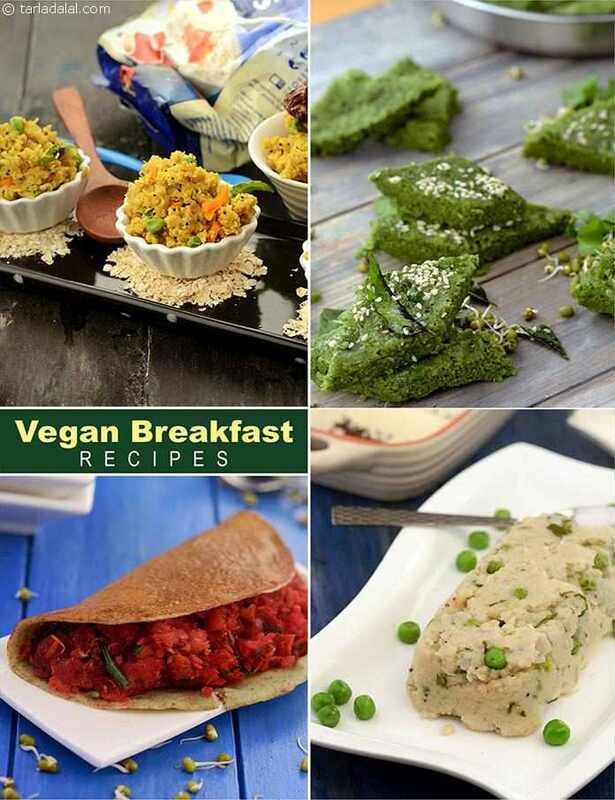 This section of Vegan Indian Breakfast is packed with really scrumptious recipe ideas, which are not only tasty and nutritious enough to pep up your whole day, but also made using commonly-available ingredients to make your work simple and quick. Care has been taken to choose the correct vegan ingredients but to avoid the use of processed and refined foods along with avoiding the use of dairy products. A healthy start to your day with these recipes will keep you going throughout the day. Try some Rice Idli with Sambar. Add more Proteins to your Idli with Rice Moong Idli. For Dosa lovers there is Dal Rice Dosa , and the multi flour 4 Flour Dosa to be had with Vegan Coconut Chutney. Try our Oats Upma and Protein Packed Poha as they are packed with protein and will provide you the necessary calories to energize your morning.